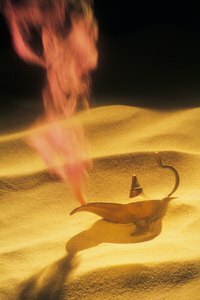 Genie is derived from the Arabic word “jinn,” meaning to hide or be hidden. The supernatural being is steeped in Arabic folklore and was introduced to the Western World in the early 1700s with the book “Arabian Nights." Since then, there have been many illustrations and animated movies of the genie -- the majority of them feature flamboyant costume and a super-sized turban. A costume turban often requires batting and is sewn by hand to keep its shape. This hat differs from the traditional turban, which is comprised of a long piece of fabric that is wrapped and tucked around the head. Measure 1 yard of lamé fabric along the selvage and cut widthwise with a pair of sharp fabric scissors. Lay this piece of fabric aside, as it will be wrapped around the head later to create the headdress’ cap. The remaining fabric will be used to create the genie turban’s band. Roll up the polyester quilted batting, lengthwise, until it is approximately 4 inches in width. This band of batting is what will give the turban its girth. Sew the edge of the batting down to the layer beneath it with a needle and thread, using the basic stitch. This will help to keep the batting from unraveling. Lay the batting on the lamé’s edge lengthwise before rolling the batting up in the fabric. Once the batting is completely covered, trim any excess fabric from the roll. Next, stitch the edge of the fabric to the roll beneath it. Curl the two ends of the fabric roll inward to meet each other. Sew the inner batting together with an “overlock” stitch. This is performed by inserting the needle into the two joining ends before looping it around and reinserting it through the two ends. Continue sewing around the joint ends to secure the batting. Once finished, sew together the lamé fabric using the same overlock stitch. The end product should be a fabric ring. Wrap metallic ribbon around the ring so that it is covering the seam, then hot glue the ribbon into place. Continue to wind the ribbon around the ring entire tightly, spacing each loop about two inches apart. The final ring should lie next to the starting point. Trim any excess ribbon before hot gluing the ribbon down, which will keep it from unraveling. Then, turn the headdress around and hot glue a feather to the center front of the ring. Assemble the genie turban by folding the 1-yard piece of fabric in half diagonally. Next wrap the fabric around the front of the head, and tie it in the back with a double knot, similar to a bandanna. Tuck the edges into the cap, so that the hair is completely covered. After the cap is in place, place the decorated headdress on top, and the genie turban is complete.